Wild goalie Devan Dubnyk was scheduled to undergo an MRI Wednesday afternoon on the lower-body injury he suffered in the 2-1 shootout win over the Flames Tuesday at Xcel Energy Center. “It's concerning because he's our No.1 goalie,” coach Bruce Boudreau said. “We want to know. But you can't race ahead of what the doctors and everybody wants. We'll see, but hopefully it's not too bad." 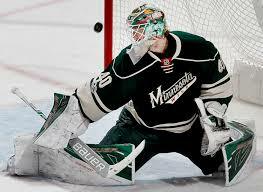 Dubnyk left after a 10-save first period, getting hurt when he moved from side to side at one point, Boudreau said. He finished out the period before backup Alex Stalock took over, backstopping the Wild to its third straight win amid a 16-save effort. Look for the team to make a call-up from the American Hockey League, as Boudreau believes Dubnyk won’t be available Thursday when the Wild’s homestand continues against the Maple Leafs. Emergency goalie Connor Beaupre, who was on hand Tuesday in case the team needed him, was on the ice for practice Wednesday with Stalock. Defenseman Jared Spurgeon also skated with the group for the first time since getting sidelined Nov.27 with a groin strain. How soon Spurgeon could be back in the lineup, though, is unclear, although Boudreau feels Spurgeon will accompany the team on its upcoming four-game road trip.